This article is about the original company prior to its split in 2011. For the present-day companies of this name and other uses, see Motorola (disambiguation). Motorola, Inc. (/ˌmoʊtəˈroʊlə/) was an American multinational telecommunications company founded on September 25, 1928, based in Schaumburg, Illinois. After having lost $4.3 billion from 2007 to 2009, the company was divided into two independent public companies, Motorola Mobility and Motorola Solutions on January 4, 2011. Motorola Solutions is generally considered to be the direct successor to Motorola, as the reorganization was structured with Motorola Mobility being spun off. Motorola Mobility was sold to Google in 2012, and acquired by Lenovo in 2014. Motorola designed and sold wireless network equipment such as cellular transmission base stations and signal amplifiers. Motorola's home and broadcast network products included set-top boxes, digital video recorders, and network equipment used to enable video broadcasting, computer telephony, and high-definition television. Its business and government customers consisted mainly of wireless voice and broadband systems (used to build private networks), and public safety communications systems like Astro and Dimetra. These businesses (except for set-top boxes and cable modems) are now part of Motorola Solutions. Google sold Motorola Home (the former General Instrument cable businesses) to the Arris Group in December 2012 for US$2.35 billion. Motorola's wireless telephone handset division was a pioneer in cellular telephones. Also known as the Personal Communication Sector (PCS) prior to 2004, it pioneered the "mobile phone" with DynaTAC, "flip phone" with the MicroTAC, as well as the "clam phone" with the StarTAC in the mid-1990s. It had staged a resurgence by the mid-2000s with the Razr, but lost market share in the second half of that decade. Later it focused on smartphones using Google's open-source Android mobile operating system. The first phone to use the newest version of Google's open source OS, Android 2.0, was released on November 2, 2009 as the Motorola Droid (the GSM version launched a month later, in Europe, as the Motorola Milestone). Motorola started in Chicago, Illinois, as Galvin Manufacturing Corporation (at 847 West Harrison Street) in 1928 when brothers Paul V. and Joseph E. Galvin purchased the bankrupt Stewart Battery Company's battery-eliminator plans and manufacturing equipment at auction for $750. Galvin Manufacturing Corporation set up shop in a small section of a rented building. The company had $565 in working capital and five employees. The first week's payroll was $63. The company's first products were the battery eliminators, devices that enabled battery-powered radios to operate on household electricity. Due to advances in radio technology, battery-eliminators soon became obsolete. Paul Galvin learned that some radio technicians were installing sets in cars, and challenged his engineers to design an inexpensive car radio that could be installed in most vehicles. His team was successful, and Galvin was able to demonstrate a working model of the radio at the June 1930 Radio Manufacturers Association convention in Atlantic City, New Jersey. He brought home enough orders to keep the company in business. Paul Galvin wanted a brand name for Galvin Manufacturing Corporation's new car radio, and created the name “Motorola” by linking "motor" (for motorcar) with "ola" (from Victrola), which was also a popular ending for many companies at the time, e.g. Moviola, Crayola. The company sold its first Motorola branded radio on June 23, 1930, to Herbert C. Wall of Fort Wayne, Indiana, for $30. Wall went on to become one of the first Motorola distributors in the country. The Motorola brand name became so well known that Galvin Manufacturing Corporation later changed its name to Motorola, Inc.
Galvin Manufacturing Corporation began selling Motorola car-radio receivers to police departments and municipalities in November 1930. The company's first public safety customers (all in the U.S. state of Illinois) included the Village of River Forest, Village of Bellwood Police Department, City of Evanston Police, Illinois State Highway Police, and Cook County (Chicago area) Police with a one-way radio communication. In the same year, the company built its research and development program with Dan Noble, a pioneer in FM radio and semiconductor technologies, who joined the company as director of research. The company produced the hand-held AM SCR-536 radio during World War II, which was vital to Allied communication. Motorola ranked 94th among United States corporations in the value of World War II military production contracts. 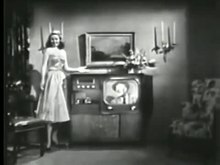 An advertisement for Motorola televisions from 1951. In October 1946 Motorola communications equipment carried the first calls on Illinois Bell telephone company's new car radiotelephone service in Chicago. The company began making televisions in 1947, with the model VT-71 with 7-inch cathode ray tube. In 1952, Motorola opened its first international subsidiary in Toronto, Ontario, Canada to produce radios and televisions. In 1953, the company established the Motorola Foundation to support leading universities in the United States. Beginning in 1958, with Explorer 1 Motorola provided radio equipment for most NASA space-flights for decades, including the 1969 moon landing. A year later it established a subsidiary to conduct licensing and manufacturing for international markets. Motorola created numerous products for use by the government, public safety officials, business installments, and the general public. In 1960, it introduced the world's first large-screen portable (19-inch), transistorized, cordless television. According to the 1962 Illinois Manufacturers Directory (50th-anniversary edition), Motorola had 14,000 employees worldwide of which at least 5,823 employees in 6 plants were located in Illinois. The company headquarters were at 9401 West Grand Avenue in Franklin Park and it listed TV receivers, Stereo-Hi Fi equipment as the products at this plant made by 1,700 employees. The Communications Division was in Chicago at 4545 West Augusta Blvd. where 2,000 employees made electronic communications equipment. The Military Electronics Division was at 1450 North Cicero Avenue, Chicago where 923 employees made microwave and industrial equipment. Two more Chicago locations were listed at 4900 West Flourney Street and at 650 North Pulaski but no employee count was listed for these. The last plant was listed in Quincy, Illinois at 1400 North 30th Street where 1,200 employees made radio assemblies for both home and automobile. In 1974, Motorola introduced its first microprocessor, the 8-bit MC6800, used in automotive, computing and video game applications. That same year, Motorola sold its television business to the Japan-based Matsushita, the parent company of Panasonic. In 1980, Motorola's next generation 32-bit microprocessor, the MC68000, led the wave of technologies that spurred the computing revolution in 1984, powering devices from companies such as Apple, Commodore, Atari, Sun, and Hewlett Packard. In September 1983, the U.S. Federal Communications Commission (FCC) approved the DynaTAC 8000X telephone, the world's first commercial cellular device. 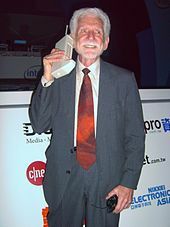 By 1998, cell phones accounted for two-thirds of Motorola's gross revenue. The company was also strong in semiconductor technology, including integrated circuits used in computers. In particular, it is known for the 6800 family and 68000 family of microprocessors and related peripheral ICs; the processors were used in Atari ST, Commodore Amiga, Color Computer, and Apple Macintosh personal computers and in the early HP laser printers, and some 6800-family peripheral devices were used in the IBM PC series of personal computers. The PowerPC family was developed with IBM and in a partnership with Apple (known as the AIM alliance). Motorola also has a diverse line of communication products, including satellite systems, digital cable boxes and modems. In 1986, Motorola invented the Six Sigma quality improvement process. This became a global standard. In 1990 General Instrument Corporation, which was later acquired by Motorola, proposed the first all-digital HDTV standard. In the same year, the company introduced the Bravo numeric pager which became the world's best-selling pager. In 1997, to optimize cell phone production with room for future growth, production was moved to the new giant factory in Harvard, Il. Later with Motorola losing market share, phone assembly was moved to Fort Worth, Tx. leaving the Harvard facility. On September 15, 1999, Motorola announced it would buy General Instrument in an $11-billion stock swap. General Instrument had long been the No. 1 cable TV equipment provider, supplying cable operators with end-to-end hybrid fiber coax cable solutions. This meant that GI offers all cable TV transmission network components from the head-end to the fiber optic transmission nodes to the cable set-top boxes and cable modems, now at the availability of Motorola. GI's acquisition created the Broadband Communications Sector (BCS). The Motorola RAZR line sold over 130 million units, which brought the company to the number two mobile phone slot in 2005. Motorola's mobile phones business failed to repeat the success of the highly popular RAZR phone, leading to it becoming rapidly dwindled. In 2006 the company's mobile phone market share was about 23% but by the end of 2007 it dropped to 12%, falling to third place behind Samsung. It was further halved again, to 6%, by 2009, by which time the market share was overtaken by LG, and by 2010 was overtaken by Research In Motion, Sony Ericsson and Apple. The company's shares also more than halved during the period and caused large losses. Motorola managed to recover with the release of the Motorola Droid in late 2009 with Verizon Wireless, which sold in good numbers and made the phone division profitable again by late 2010. Pager and cell tower component manufacturing\development 5401 Beach St. and 5555 Beach st. Fort Worth, TX respectively. In January 2011, Motorola split into two separate companies, each still using the word Motorola as part of its name. One company, Motorola Solutions (using a blue version of the Motorola logo), is based in the Chicago suburb of Schaumburg, Illinois, and concentrates on police technologies, radios, and commercial needs. The other company, Motorola Mobility (using a red logo), is based in Chicago (formerly at 600 US-45, Libertyville, Illinois), and is the mobile handset producer. The split was structured so that Motorola Solutions was the legal successor of the original Motorola, while Motorola Mobility was the spin-off. On October 30, 2014, Google sold off Motorola Mobility to Lenovo. The purchase price was approximately US$2.91 billion (subject to certain adjustments), including US$1.41 billion paid at close: US $660 million in cash and US$750 million in Lenovo ordinary shares (subject to a share cap/floor). The remaining US$1.5 billion was paid in the form of a three-year promissory note. After the purchase, Google maintained ownership of the vast majority of the Motorola Mobility patent portfolio, including current patent applications and invention disclosures, while Lenovo received a license to the portfolio of patents and other intellectual property. Additionally, Lenovo received over 2,000 patent assets, as well as the Motorola Mobility brand and trademark portfolio. Mobile Devices: Headquarters located in Chicago, Illinois; designs wireless handsets, but also licenses much of its intellectual properties. This includes cellular and wireless systems and as well as integrated applications and Bluetooth accessories. Some of their latest gadgets are Moto X Gen 3, Moto X Play, Moto 360 smartwatch, etc. In November 2017, Moto X4 was launched in India with pure Stock Android Nougat. In December 2017, it was announced that the phone users in India will soon start receiving Oreo updates. Due to declines in business in 2000 and 2001, Motorola spun off its government and defense business to General Dynamics. The business deal closed in September 2001. Thus GD Decision Systems was formed (and later merged with General Dynamics C4 Systems) from Motorola's Integrated Information Systems Group. On August 4, 1999, Motorola, Inc.'s Semiconductor Components Group, manufacturing Motorola's discrete, standard analog and standard logic devices was spun off, recapitalized and established as an independent company named ON Semiconductor. The new company began trading on the NASDAQ on April of the following year. On Dec. 7, 2015, Freescale Inc. was sold to NXP Semiconductor, a former Philips semiconductors European company. In July 2006, Motorola completed the sale of its automotive business to Continental AG. Motorola's automotive unit had annual sales of $1.6 billion (€1.33 billion) and employed 4,504. The division's products included telematics systems - like GM's OnStar used for vehicle navigation and safety services, engine and transmission control electronics, vehicle control, electronics and sensors used in steering, braking, and power doors and power windows. On February 11, 2010, Motorola announced its separation into two independent, publicly traded companies, effective Q1 2011. The official split occurred at around 12:00 pm EST on January 4, 2011. The two new companies are called Motorola Mobility (now owned by Lenovo; cell phone and cable television equipment company) and Motorola Solutions (NYSE: MSI; Government and Enterprise Business). Motorola Solutions is generally considered to be the direct successor to Motorola, Inc., as the reorganization was structured with Motorola Mobility being spun off. Motorola Solutions retains Motorola, Inc.'s pre-2011 stock price history, though it retired the old ticker symbol of "MOT" in favor of "MSI." Google maintained ownership of the vast majority of the Motorola Mobility patent portfolio, including active patent applications and invention disclosures. As part of its ongoing relationship with Google, Lenovo received a license to this rich portfolio of patents and other intellectual property. Additionally, Lenovo received over 2,000 patent assets, as well as the Motorola Mobility brand and trademark portfolio. On October 30, 2014, Lenovo finalized its purchase of Motorola Mobility from Google. Motorola, Inc., along with the Arizona Water Co. has been identified as the sources of trichloroethylene (TCE) contamination that took place in Scottsdale, Arizona. The malfunction led to a ban on the use of water that lasted three days and affected almost 5000 people in the area. Motorola was found to be the main source of the TCE, an industrial solvent that can cause cancer. The TCE contamination was caused by a faulty blower on an air stripping tower that was used to take TCE from the water, and Motorola has attributed the situation to operator error. The company is also increasing the proportion of recycled materials that used in its products. For example, the housings for the MOTO W233 Renew and MOTOCUBO A45 Eco mobile phones contain plastic from post-consumer recycled water cooler bottles. According to the company's information, all of Motorola's newly designed chargers meet the current Energy Star requirements and exceed the requirements for standby/no-load modes by at least 67%. Motorola sponsored Scottish Premier League club Motherwell F.C. for 11 years. This long-term deal ended after the company started to reduce its manufacturing operations in Scotland. The company also sponsored Livingston F.C. between 1998 and 2002. The company also had a plant on the edge of the town. However, this closed down at the same time as their sponsorship with the club ended. The South Stand at Livingston's Almondvale Stadium, was named after the company, during their time of sponsorship. The company also sponsored a cycling team that counted Lance Armstrong amongst its members. Motorola is also a sponsor of Danica Patrick, David Beckham, and Fergie. It also sponsored the Richmond Football Club in the Australian Football League from 2004 to 2007. Motorola sponsored São Paulo FC from 2000 to 2001. Motorola also sponsored Club Bolívar since 2008. Motorola awarded TrackIT Solutions for being "The company with most Innovative Enterprise Mobility Solution" in 2010. Motorola sponsored the golf tournament Western Open from 1994 to 1999. ^ a b "Motorola Solutions, Inc. 2013 Annual Report Form (10-K)" (XBRL). United States Securities and Exchange Commission. February 13, 2014. ^ Ante, Spencer E. (January 5, 2011). "Motorola Is Split Into Two". The Wall Street Journal. Retrieved January 4, 2011. ^ a b "Motorola Solutions Inc: NYSE:MSI quotes & news – Google Finance". Retrieved July 12, 2011. ^ Roger Cheng, CNET. "It's official: Motorola Mobility now belongs to Lenovo." October 30, 2014. Retrieved March 7, 2017. ^ Gelles, Claire Cain Miller and David. "After Big Bet, Google Is to Sell Motorola Unit". Retrieved 26 June 2016. ^ "We've acquired Motorola Mobility". Google Official Blog. Retrieved May 22, 2012. ^ Lenovo to Acquire Motorola Mobility from Google – Investor Relations – Google. Investor.google.com. Retrieved on 2014-01-30. ^ a b "Hello Moto". Lenovo. Retrieved October 30, 2014. ^ Mahon, Morgan E. A Flick of the Switch 1930–1950 (Antiques Electronics Supply, 1990), p.111. ^ "Joseph E. Galvin (1899 - 1944) - Find A Grave Memorial". Retrieved 26 June 2016. ^ "Paul Vincent Galvin (1895 - 1959) - Find A Grave Memorial". Retrieved 26 June 2016. ^ “Calling All Cars,” Motorola Solutions History, accessed November 5, 2014, http://www.motorolasolutions.com/US-EN/About/Company+Overview/History/Explore+Motorola+Heritage/Calling+All+Cars. ^ a b Hempel, Jessi (September 28, 2009). "Motorola gets in the game". CNNMoney.com. Retrieved May 30, 2012. ^ "Motorola History Milestones". Motorola Inc. Retrieved November 13, 2017. ^ "Historic News Releases". Motorola Inc. Retrieved November 13, 2017. ^ These include the MC6845 CRT Controller—used in the MDA and CGA adapters and the PCjr and emulated in the EGA, MCGA, and VGA—and the MC146818 real-time clock in the IBM AT. ^ "ON Semiconductor". ON Semiconductor. Retrieved April 18, 2013. ^ "Motorola layoffs". Chicago Tribune. 28 June 2002. Retrieved 9 January 2015. ^ "Remembering the Razr: The device that snapped shut the era of flip phones". Digital Trends. 2012-12-28. Retrieved 2017-08-15. ^ King, Ben (September 28, 2005). "How Britain lost Sendo". The Register. Retrieved January 16, 2011. ^ "Motorola acquires TTPCom AJAR Software Platform". Motorola Inc. Archived from the original on April 16, 2007. Retrieved July 12, 2011. ^ "iRadio". Motorola Inc. Archived from the original on January 19, 2008. Retrieved February 3, 2008. ^ "Motorola in Trouble-|Business Strategy|Case Study|Case Studies". ^ Clark, Andrew (1 February 2008). "Motorola may quit mobile phone market". The Guardian. Retrieved 28 December 2018 – via www.theguardian.com. ^ Linge, Nigel. "Motorola brought us the mobile phone, but ended up merged out of existence". The Conversation. Retrieved 28 December 2018. ^ "RIM and Apple Displace Motorola - CdrInfo.com". www.cdrinfo.com. Retrieved 28 December 2018. ^ "Gartner Says Worldwide Mobile Phone Sales Grew 6 Per Cent in 2008, But Sales Declined 5 Per Cent in the Fourth Quarter". www.gartner.com. Retrieved 28 December 2018. ^ "Motorola's decline seen as cautionary tale". 14 February 2008. Retrieved 28 December 2018 – via www.reuters.com. ^ Press, The Associated (3 February 2009). "Motorola Suspends Dividend Amid $3.6 Billion Loss". Retrieved 28 December 2018 – via NYTimes.com. ^ Fishman, Ted C. "What Happened to Motorola". Chicago magazine. Retrieved 28 December 2018. ^ JENNA WORTHAM, The New York Times. "Nokia Siemens Agrees to Pay Cash for Division of Motorola." July 19, 2010. Retrieved Jan 20, 2017. ^ "Google's Motorola acquisition: Nail in the Android patent coffin?". ZDNet. Retrieved 2012-02-19. ^ "Motorola Mobility Stockholders Approve Merger with Google". Motorola Mobility, Inc. November 17, 2011. Archived from the original on November 20, 2011. Retrieved November 28, 2011. ^ a b "Lenovo to Acquire Motorola Mobility from Google". Retrieved 2018-09-04. ^ "Motorola Mobility – Motorola Solutions – About Motorola – Directional Landing Page". Motorola Inc. January 4, 2011. Archived from the original on November 13, 2008. Retrieved July 12, 2011. ^ Geethesh Bhat, Savvydroid. "Moto X4 Android Oreo update begins rolling out in India." Dec 28, 2017. Retrieved Jan 23, 2018. ^ "Motorola profit slides on mobile woes; shares hit 5-year low". MarketWatch. January 23, 2008. Retrieved July 12, 2011. ^ "Motorola CTO Richard Nottenburg takes off". Engadget. Retrieved July 12, 2011. ^ "Motorola Phones Sales Crash 38 Per Cent". TrustedReviews. 2007-02-14. Retrieved July 12, 2011. ^ "Motorola to lay off 3,500". Engadget Mobile. Retrieved July 12, 2011. ^ "Motorola cuts another 4,000 jobs". Engadget Mobile. Retrieved July 12, 2011. ^ "Motorola sues former employee turned Apple exec for ganking trade secrets". Engadget. Retrieved July 12, 2011. ^ "Motorola insider tells all about the fall of a technology icon". Engadget. Retrieved July 12, 2011. ^ Olga Kharif and Roger O. Crockett (July 10, 2008). "Motorola's Market Share Mess". BusinessWeek. Retrieved August 4, 2008. ^ "Motorola ends fiscal Q2 with healthy profit – GSMArena.com news". Gsmarena.com. Retrieved July 12, 2011. ^ Dana Mattioli and Gillian Tan, Wall Street Journal. "NXP, Freescale Agree to Merger." Mar 1, 2015. Retrieved Jul 10, 2018. ^ "Detailed History". Prestolite Electric Inc. Retrieved 2012-06-13. ^ "Motorola Mobility, Inc. – Media Center – Press Releases – Motorola Targets First Quarter 2011 to Separate into Two Independent, Publicly Traded Companies". Mediacenter.motorola.com. February 11, 2010. Archived from the original on February 14, 2010. Retrieved July 12, 2011. ^ Tsukayama, Hayley (August 15, 2011). "Google agrees to acquire Motorola Mobility". The Washington Post. Retrieved August 15, 2011. ^ "Google to Acquire Motorola Mobility" (Press release). Google. August 15, 2011. Retrieved August 15, 2011. ^ Steven Musil, CNET. "Motorola Mobility shareholders approve Google merger." Nov 17, 2017. Retrieved Aug 30, 2017. ^ Richard Lawler, EnGadget. "Arris closes deal to buy Motorola Home cable and internet biz from Google." April 17, 2013. Retrieved Jun 3, 2017. ^ Balazs, Diana (May 9, 2008). "Companies trying to prevent PV water pollution". The Arizona Republic. Retrieved July 12, 2011. ^ a b "Greenpeace – Guide to Greener Electronics". Greenpeace International. Archived from the original on January 13, 2011. Retrieved January 12, 2011. ^ "Motorola – Material content". Motorola. Archived from the original on August 8, 2010. Retrieved January 12, 2011. ^ "Motorola – Energy efficiency". Motorola. Archived from the original on August 9, 2010. Retrieved January 12, 2011.